Long-term readers will note that in years past (seven, to be exact – which coincidentally matches up with the number of years Rupert has been a member of our household – go figure!) this has been a very cat-involved process. 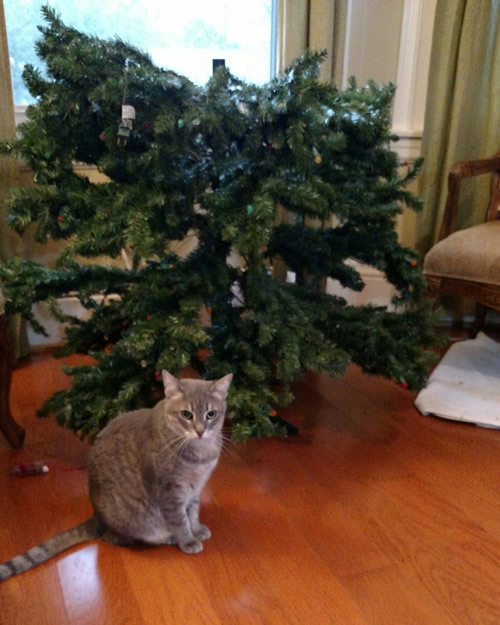 After all, when one has cats that regularly treat the Christmas tree as just another jungle gym, one accumulates a selection of inexpensive, non-breakable ornaments and keeps all the nice, breakable ones packed securely away for the distant future when this is no longer a problem. And after the first year or so we just sort of shrugged and pretty much embraced the cat-infested tree, and I admit I actually sort of look forward to seeing who scales it first. 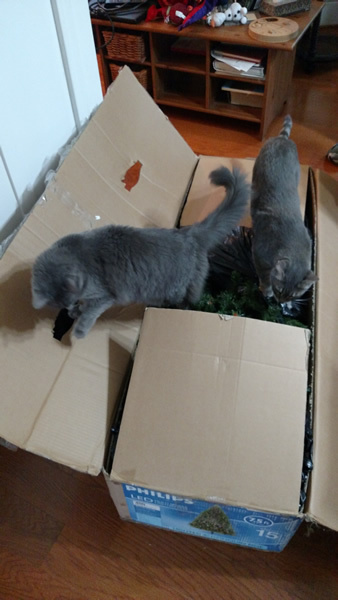 We pulled the tree box out. Sherman practiced looking innocent. We opened up the box. 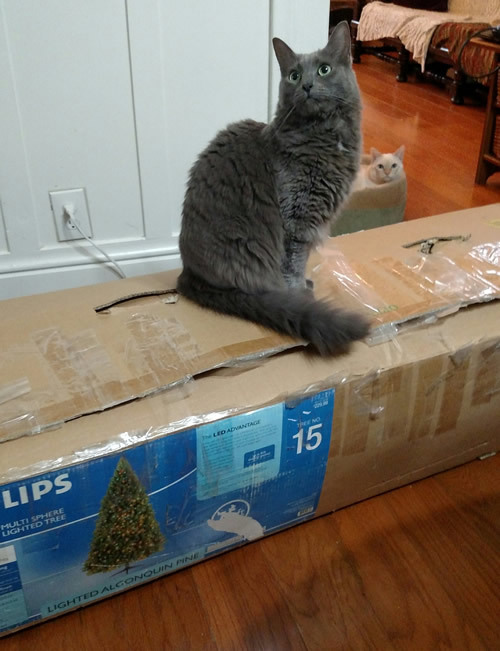 Rupert and Sherman immediately had to investigate. First section set up. 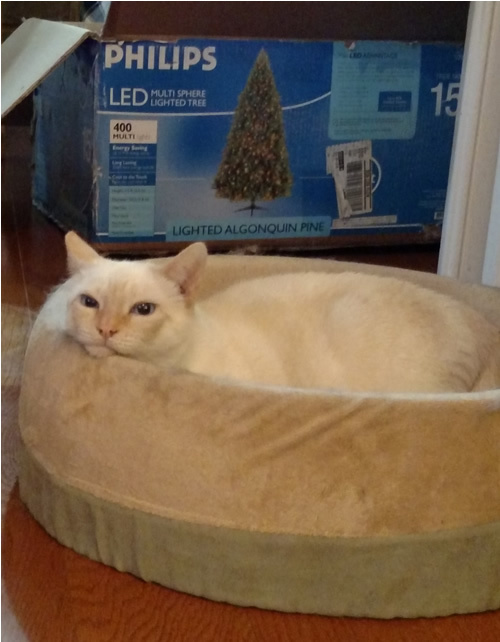 Rupert came over and sniffed but then basically did the cat equivalent of shrugging and ignored it. Nutmeg’s enthusiasm for the whole process, meanwhile, was palpable. Sherman – who’s been our primary ‘supervisor’ in years past, climbed up briefly, but once a branch accidentally smacked him in the face, he wandered off. He bounced around the room a bit, but climbing the tree just wasn’t on his mind. 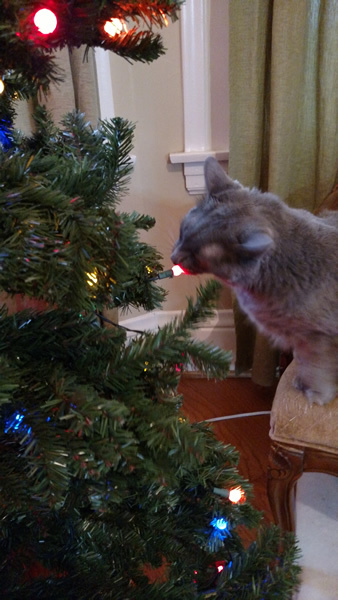 We put up all the ornaments – a couple cats came over to investigate those and Sherman did the customary taste-test on the tree lights (for some reason he really likes to gnaw on them. Luckily they’re made of super-thick plastic so he can’t hurt them). The fully decorated tree, with a festive top. 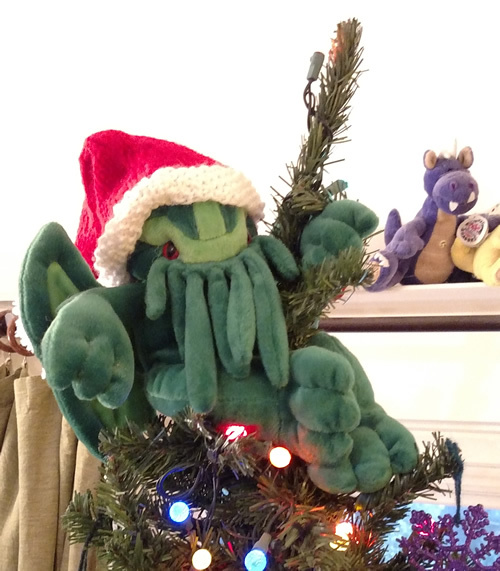 A close-up of the tree topper. The Santa hat is what makes him festive. Ho, ho, he’ll drive you all insane, ho. 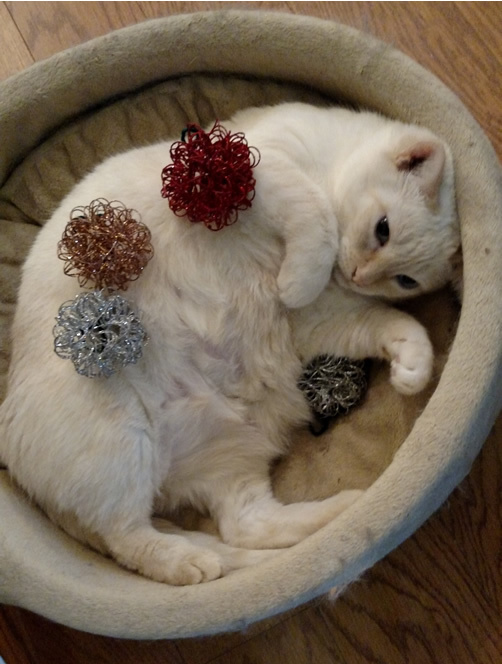 Later we decided to decorate Nutmeg, who is clearly thrilled by the experience. Sweet kitties! Oh cat vs tree is a daily struggle. My 1 year old Siamese tries to climb to the top almost every night.